Last year after missing my PR by 1 second in October at the Run Crazy Horse Half Marathon in western South Dakota, I was on a quick search for a second try! There are not many half marathons within driving distance of Rapid City, SD. There are even less in October and November, so you can imagine how thankful I am for Pink Gorilla Events to hold the Halfsy when they do. I ended up missing my PR by 20 seconds but still enjoyed the event and hope to race the Halfsy in Lincoln again soon! Below are my five favorite pieces of advice I like to share with those who ask for general racing tips. Keep them in mind as you train for and when you run The Good Life Halfsy and I have little doubt you’ll get a bit closer to that PR! We’re starting with the easiest. Did you know that courses are measured via the shortest possible route? People not running this route is one of the most frustrating things I see at races and something so easy to fix. Run straight from corner to corner instead of staying on one side of the path. That means when you take a turn wide, you’re running farther than the course actually is! Now imagine you take 10 wide turns over a half marathon. You signed up for 13.1 miles, not 13.5! There went your PR. You’ll notice that none of these have anything to do with your fitness level. They are applicable for everyone and not only for this event. I’ve read a lot of research studies over the years, but one that compared racers in an actual race and their position before and after a hill was the one that has stuck with me the best because it’s so applicable to real life and so easily to put into practice. This one is simple as well, slow down when you go up an incline instead of trying to maintain the pace. The researchers determined that while this may cause you to lose time compared to other runners right at that very moment, over the course of the race duration the individuals who slowed going up had more stamina once they reached the top and were able to accelerate and pass the runners who expired because they maintained pace. Don’t let that downhill profile fool you, those first few miles are not easy! Course previews range from the obvious physically checking out the course before race day to reading about the event online. A fast way is to simply search Google for the name of your race + race report and read the experience other people have had at past years of the event. Race reports will often mention how the start is organized, what aid stations are like, crowd support, etc. It’s the truth, not embellished by the race website. Of course, the race website is full of helpful information as well. The Race Guide is sooo great! Get familiar with the shuttle service, exactly what hydration and calorie options will be available and at what intervals on the course, and look at the elevation profile so you’re aware of any steep bridges or climbs at the end in an otherwise downhill course. The absolute best option is to actually train on the course. If you’re training in Lincoln, your long runs will likely be very near to 13.1 miles and doing them on the course is wise. The more familiar you are with bad roads, steep downhills, and surprise uphills, the better! 4) Be mindful of the wind. There is little doubt that the midwest is notorious for being windy. Point to point courses like The Good Life Halsy are fun, but you always have that risk of a super long stretch with a headwind. If there is a wind out of the north on race morning, you’re going to feel incredibly quick for the first 5k and then reality will strike as you turn towards Holmes Lake and begin 8 miles into that northern wind. The hills on the course map are static, they are there now and will be there on race day. But the wind can create mountains out of molehills and can change day to day. Find a flag on race morning and simply be aware of its direction. If it’s a south-eastern wind, you’ll run a bunch of the race with a tailwind, which is great! But be mindful that this wind direction will make the early hills a bit more challenging and it will make the middle 8 miles a bit warmer. The important thing is that recognizing this before you start the run put you a step ahead. 5) Don’t Forget the 5P’s! I saved the best for last since I wanted this to stick. Proper pacing prevents poor performance. Do not forget it! No amount of good training, perfect calories, and adequate hydration will save you if you run the first third of the race distance too fast. The final third of a race is full of people barely shuffling forward who “had a great first half”. Don’t be one of them! Let people go off ahead during the first third of the race distance, many of them will expire and you will pass them feeling well. Just don’t count passes out loud, it’s rude. For just about any distance, I like to recommend my clients break it up into three parts. Run the first part easy, which will be much faster than your typical easy pace. Speed up a bit for the middle third but keep it controlled. And then for the final third, whether it’s during a 5k or a marathon, you can basically run at best effort. It’s impossible to bonk when your body knows the finish line is near! 6) High five kids who have their hands reached out for high fives! I hope you found these tips helpful! Regardless of your experience level or knowledge, putting even one of these into practice will help. You will put hundreds of hours into training for this half marathon, don’t sacrifice your goal by making any easily avoidable mistakes at the event! And please, say hi to me if you see me at the start! Bonus: Want to crush your recovery after The Good Life Halsy? Check out my Recovery Cheat Sheet! 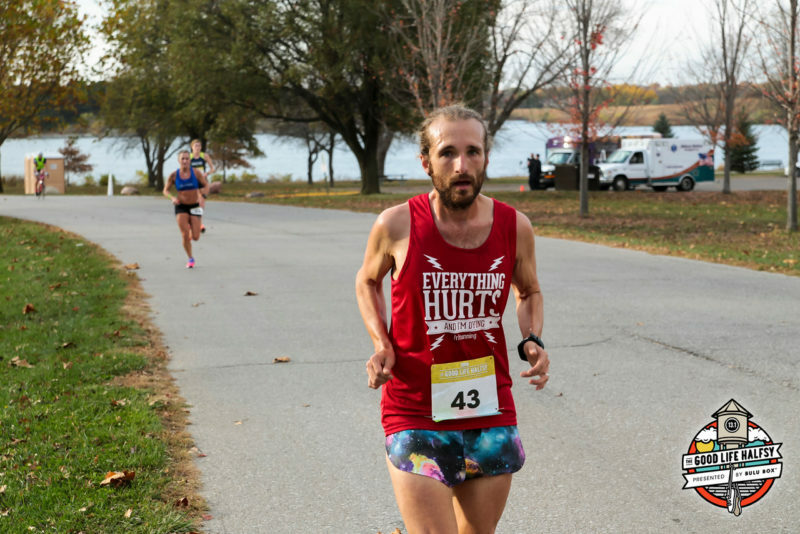 Kyle Kranz is a runner and running coach living in Rapid City, South Dakota. He considers himself retired because if he had a billion dollars & never had to work another day in his life, he would do the same thing he does now. As a running coach he spends his days reading & writing about running, as well as interacting with runners all over the world. To learn more about Coach Kyle, visit kylekranz.com.